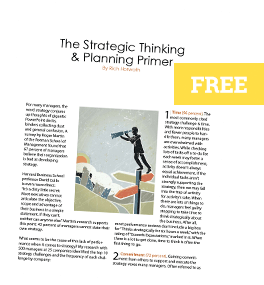 Strategic Thinking Traps: Anchor’s Away! In making decisions, the mind tends to give initial information or impressions a disproportionate amount of weight. This tendency is referred to as an “anchor.” The anchor jades the strategic thinking process because it starts the process at an artificially high or low point. Most commonly, anchors take the form of last year’s strategic plan or this year’s financial forecast. By using the assumptions that went into last year’s plan, strategy becomes fatally flawed. Strategic thinking demands that all assumptions, beliefs, and information be looked at from a fresh perspective on a continual basis. Create an open mind by actively considering the range of starting points available, not just the anchor point. View the issue from different frames (e.g., marketing manager should seek views of HR, sales, and operations managers). Identify anchors as soon as they appear and call them out mentally and physically (on paper/PC/flip chart) so everyone is aware of their presence. On the surface, benchmarking gives the appearance of one of those activities that unquestionably add value to an organization. And therein lies its danger. When benchmarking best practices, it is critical to understand what exactly is being benchmarked. The first discipline of strategic thinking is acumen, and a key aspect of successfully generating insight is to understand the context. The context of best practices includes such things as culture, compensation, market state, competitive position, leverage relative to suppliers, customer influence, etc. Identify what exactly is being benchmarked. Describe the context in which the benchmarked practice is occurring and compare it to your situation. Identify the strategy ecosystem of the benchmarked practice and the relationships involved in the system. Computers have the ability to analyze in a completely objective manner. Human beings do not. Subconsciously, people tend to make decisions first and look for information afterward to support their decisions. Confirmation bias is the human condition of seek- ing data and information to support what you believe while discounting evidence to the contrary. Good strategists understand that they bring a particular frame to viewing their business. Becoming locked into that frame causes people to dismiss other frames and perspectives without giving them proper consideration. Record the evidence for each position in a ledger format to enhance an objective view. Acknowledge the underpinnings of your reason for taking a position and consider the opposite motivations. Bring in someone to present the other positions to provide a fresh perspective.